Are you thinking of listing your home for sale in St.Louis Park? Be aware of the Point of Sale inspection which is required whenever an owner intends to sell a residential property. The inspections are performed by a city inspector and typically cost $225. According to the St. Louis Park website, the transfer of property cannot take place until a property maintenance certificate has been issued. typically involve the buyers Realtor, the sellers Realtor, the buyers loan appraiser, the buyers private home inspector and the sellers point of sale inspector. If electrical repairs are required by either the private or city inspector, we may need an electrical permit and have a separate electrical inspection performed. The process as a whole can be intricate – precise communication and attention to detail is important! 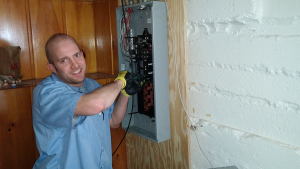 At Edison Electric, our electricians are familiar with the process of performing repairs at the point of sale. Whether you need a lien waiver or an electronic copy of your work order, we have you covered! Make sure the sale of your home goes smoothly; schedule your point of sale inspection before you list your property for sale and let Edison Electric worry about any required electrical repairs. Call today! 612-385-7864 – or visit our website for more information on code compliance repairs.